Turmeric has gotten lots of attention lately. Just go on instagram and search #goldenmilk and you’ll see what I mean. And for good reason! A growing body of research shows it is a nutritionally potent spice with medicinal properties, mainly due to a compound found in turmeric called curcumin. Many chronic diseases have been linked to ongoing low grade inflammation. This inflammation can manifest from stress, processed foods, too much sugar, lack of sleep, and an unhealthy lifestyle overall. One of the biggest health benefits of curcumin is its strong anti-inflammatory properties. So it’s no wonder that studies show curcumin can be beneficial for preventing heart disease, arthritis, cancer, alzheimer’s and other degenerative diseases. It is also a powerful antioxidant which helps fight off free radicals that naturally occur in the body. Curcumin is fat soluble, which means it’s best consumed with some fat for optimal absorption. In addition, black pepper can also help increase absorption due to its piperine content. Turmeric is a great spice to add flavor and vibrant color to food! I mean, who doesn’t want pretty food, amiright? You can easily incorporate it into your meals by adding it to spice rubs, in rice or quinoa, and my personal fave – roasted veggies! I especially love it in cauliflower because the bright yellow can really stand out against cauliflower’s neutral white color. And also because its delicious! I can easily go through a whole head of roasted cauliflower all on my own. Try it for yourself and you’ll see what I mean. GET IT! Roughly chop cauliflower into desired size. 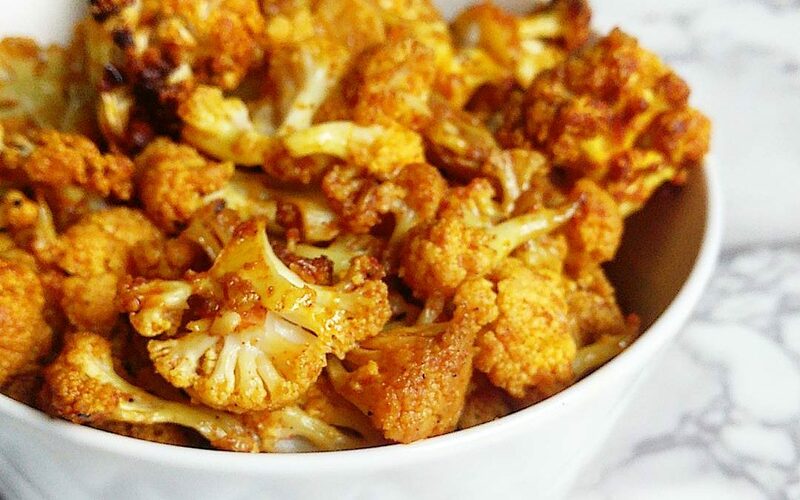 Toss cauliflower with avocado oil, tumeric, paprika, garlic powder, salt, and pepper. Spread out on baking sheet and bake for 20 – 30 minutes (depending on how soft you like it. I prefer 20 minutes so it has good bite to it). Drizzle with a touch of olive oil before serving. Enjoy! !